Design the layout and program parts of HMI (Human Machine Interface) according to the customer's order and specifications. Rolling mill contained three parts connected and controlled together. Roughing Mill (RM)- Steckel Mill (SM) - Finishing Mill (FM). Screens that are collecting all important information for operators or maintainance staff at one place. Screens of hydraulic system supporting oil for hydraulical movements. Screens showing the status of all controllers of movements in whole finishing mill area. Screens showing the status of all controllers of movements in whole Steckel mill area. Screens showinng positions of already rolled coils and positions of material head and end. 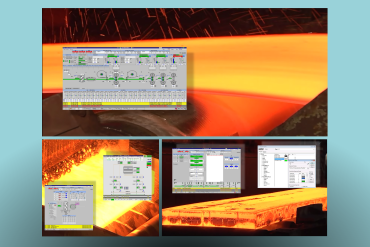 Screens with status of cooling valves and information about cooling amount for each part of rolling mill. Screens showing the status of coiling area. Screens showing the status of exit sections for transporting the coils from the rolling process. Overview of all drives of rolling mill, switching them ON or OFF. Screens for diagnosis to see the status of each part of system. Screens with errors and warnings overview and posibility to filter them for better investigation of problem. Screens handling data exchange from and to superior systems. Integration test was done in Germany at SMS Siemag AG company. The main point of integration test is to simulate whole technological entity and test all programmed parts together to reduce the commissioning time at customer.